On an autumn Saturday just gone with some of my family I walked from Wasdale Head in the English Lake District up, and up, and up. It wasn’t an unusual walk: we followed the ridge from Brackenclose and Lingmell Gill up the ridge to the peak of the same name, then across and up to Scafell Pike, England’s highest top, then across to Broad Crag and Great End before descending via Esk Hause. Nor was the weather unusual: we ascended into clouds as we climbed Lingmell, and were in and out of it until coming down past Sprinkling Tarn. All in, we spent maybe three or four hours walking around between the tops of things. Paths, especially the drudgy walk up Scafell Pike, were rocky and the green slopes of the lower fells felt a long way away. But what a feeling it was to be so high up! And not only high up, but at the ceiling of England. There are higher places, even in Britain, but the noises of rock on rock on foot; the cawing and popping of what looked like a raven and the occasional dripping of an infant spring seemed to be amplified by the cloud and almost echoing. 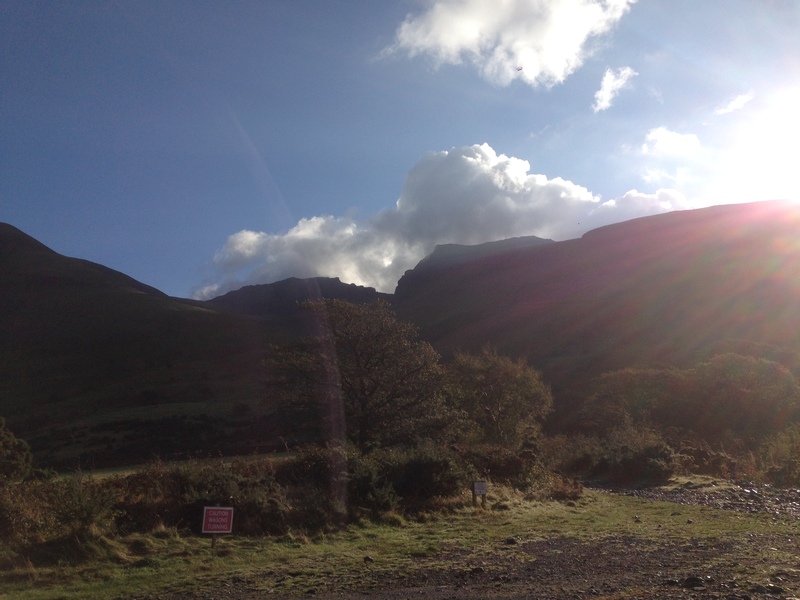 The sun shone brightly on the way home, and had dipped behind Yewbarrow by the time we reached the Wasdale Head Inn. It was stuffed with people and we sat outside, elated and tired. Later we walked back to Brackenclose and could see the headlamps of late finishers heading down the Tourist Track from Scafell in pitch black, with stars and evening chill for company. Lucky us. This entry was posted in Uncategorized and tagged England, Lake District, Mountains, Scafell Pike, Wasdale. Bookmark the permalink.